Manchester United’s woes so far this season are due to a lack of consistency in their midfield-attacking link up. A flurry of players have been experimented in the positions by Jose Mourinho to a mixed array of success, none satisfactory. To add to the dilemma is the apparent ousting of Henrikh Mkhitaryan from the squad despite the Armenian initially showing a glimmer of what a traditional central attacking midfielder must do in the United jersey. However, this dilemma might find an easy solution in the form of one Real Madrid man who has revealed Mourinho’s interest in his services. As per Diario Gol, Marco Asensio has informed Real Madrid of an offer from Manchester United in the upcoming January window. 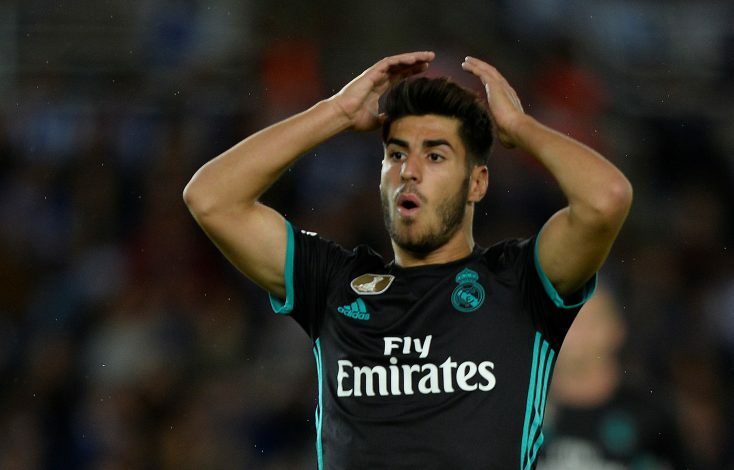 The report added that in Asensio, Jose might find the perfect breed of player to keep alive some hope in a title race that quickly seems to be going one-way. The young Spaniard, despite his decisively skillful arsenal, has been used sparingly by Zinedine Zidane so far this season. This comes as much surprise due to the 21-year-old’s performances with Spain’s U-21 side last season. To add to the saga, it seems that while Zidane wouldn’t mind letting go of him, President Florentino Perez wishes to keep the youngster a part of Los Blancos owing to his scary potential. If a move does go through, it is undoubted that he will find regular game time at Old Trafford. The precarious position of things has ensured that creativity is the need of the hour for Mourinho’s side, and Asensio could undoubtedly prove to be the quick fix. Further, unless Madrid holds out for a last-minute screamer of an amount, he could even be a cheaper and potentially more profitable option in the long run when compared to some of the other older and more expensive players of the sort in the market. It is high time for United to make such a move, and this could very well lead to a grand saga for the month of January.